Abstract: The rise of the service sector has created a rise in female employment in developed countries. Turkey, a developing country with an unusually low female share of employment and low service share of employment, provides an opportunity to test whether developing countries can have a similar experience. We use a multi-sector structural transformation model with goods and service sectors and home production to understand how much of the female employment share gap between Turkey and the developed countries would disappear with a closing gap in their service shares of employment. 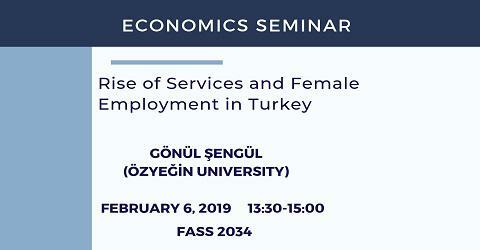 Under plausible assumptions, the rise of service sector in Turkey may elevate the female employment share to a level that is comparable to the levels in developed countries. Through counterfactual exercises, we find that the within-sector change (relative demand for female labor in services) is much more crucial than the between-sector changes to increase the female employment in Turkey, contrary to the observations for developed countries.